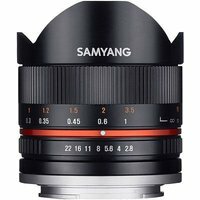 The Samyang 8mm f/2.8 UMC Fisheye II lens offers an improved optical construction containing 11 elements in 8 optical groups including 2 aspherical and 3 ED elements for optimum optical performance. The lens includes a built-in lens hood and the latest generation multilayer anti-reflection ultra multicoating (UMC) to minimise flare and ghosting. Fisheye lenses are popular for special effects use where distortion, exaggerated perspective and extreme depth-of-field are desired. Manual focus operation only.